When it comes to performing on-page optimization, writing the perfect meta description is extremely crucial. A meta description is the short descriptive text which appears under every search result on SERP. Its main role is to inform the visitors about what to expect from the web page. However, the meta description is not only for the visitors as it also helps the search engine to understand what a particular web page is all about. Each search result on SERP has a specific meta description, even if the page’s source code doesn’t have one. In case the website owner hasn’t manually added the meta description, Google creates its own description by going through the web page content. Furthermore, if your meta descriptions do not match the recommended guidelines, Google will again create a dynamic description to display. In any case, none of the search results on SERP is displayed without a description. So, the real question that we must ask ourselves is how meta descriptions are important from an SEO perspective and why should you bother optimizing them for the search engine? To answer these questions and help you understand the significance of meta description in SEO. The meta description is one of a web page’s meta tags. With this meta information, webmasters can briefly sketch out the content and quality of a web page. The page description for a web page is usually displayed when the page for a specific query is listed as a snippet in the SERPs. The above snippet shows a meta description for a blog post published by Neil Patel. In this case, as you can see, Google has automatically picked a description on its own. Even though this doesn’t harm the website performance, automatically generated descriptions are not as descriptive as the ones published manually. Take a look at the following meta descriptions example to understand why manual descriptions are better. As you can see that the above meta description makes it much easier for the user and search engine to understand the context of the web page. Furthermore, by adding “2019”, the publisher has made the entire meta description more captivating, encouraging the user to click on the link. Along with the meta description, Google can also provide other site links, redirecting users to other web pages of the website. How Meta Descriptions Impact SEO? Now, that you know what meta descriptions are, let’s understand why they’re an important part of SEO and the best practices, you can utilize to create meta descriptions for your web pages. It is important to understand that the meta description doesn’t have a direct impact on your search engine rankings. Google never reads the meta description to index and rank your websites. It is just a small description that gives away the overall context of the web page in a brief manner. However, you must know that the meta description does impact the rankings indirectly. How? Well, as we mentioned earlier, informative and appealing meta descriptions will encourage a user to click on the search result. As a result, the click-through rate (CTR) for the web page will improve. If you are familiar with the Google ranking factors, you must know that CTR is one of the crucial factors which Google utilizes to rank the web pages. So, we can say that the meta description of a web page does have a considerable impact on the improving the search engine rankings and that’s why you must put in your time and efforts to publish well-optimized meta descriptions. Writing SEO-friendly meta descriptions is a fairly easy task, and as long as you have a basic writing knowledge, you can easily optimize the description for each web page. All you have to do is adhere to the following basic guidelines. As of good SEO practices, the meta description length can be anywhere between 150-170 characters. Your description should neither be shorter nor be longer than the recommended character length. In case the length exceeds the given meta description character limit, Google will either cut a portion of the length or create a description on its own by analyzing the page content. In both cases, the user experience is at risk. So, it is important that your meta description is in between 150-170 characters. Here’s the thing, you cannot write the same meta description for multiple web pages and expect everything’s going to be fine. The meta description should be descriptive and should give a brief introduction to the web page itself. Since it is certainly not possible for different web pages to have the same content, it doesn’t make sense to publish the same meta description for different web pages. This includes everything, the home page, service pages, blogs, etc. Even if you have published multiple blogs on the same topic, you should take time to write an individual description for each web page. The sole purpose of having the meta description along with every web page is to provide visitors with a brief context of the web page. Therefore, it is extremely crucial that each web should have an informative description. While writing the description, make sure that it is relevant to the web page content and summarizes the overall web page within the recommended character limit. There’s no point in writing descriptions which have no relation to the web page. If anything, they’re going to damage the user-experience and may lower the click-through rate as well. Even though there are many CMSs out there which automatically generate a meta description based on the web page content, one should never rely on them. As we mentioned earlier, automatically generated descriptions may not be as informative as the ones manually written by a person. Furthermore, these meta descriptions are neither search engine or user-friendly. So, make sure to avoid auto-generated descriptions and write a description for each web page on your own. Despite the fact that description is not a ranking factor, you must add your target keyword to the description. Reason being, while displaying the search results, Google tends to highlight specific keywords for a given search query. It means that if your description has the target keyword, it will be highlighted separately, which will encourage the user to click on the link, thereby improving the CTR. You can also add LSI keywords to the description to make them query-specific. However, you must avoid keyword stuffing at every cost. Make sure to maintain a natural flow while precisely adding the keywords. You need to make your meta descriptions as appealing as possible. Therefore, it’s always a good SEO practice to avoid writing generic descriptions and use your creativity to come up with highly captivating descriptions. However, it is still important that the description is relevant to the web page itself. When it comes to performing SEO, your competitors will always help you identify the best practices to captivate your target audience. Take a look at what strategies your competitors are utilizing with their meta descriptions and adhere the same to write descriptions for your web pages. If you have recently made changes to the web page, make sure to update the meta description as well. The users always look forward to reading updated content. However, it’s your job to notify a user about any update you have made to the content on your web pages. To do so, add the last updated date to help the users identify the recent updates. The above SEO guide is quite an old guide published by Brain Dean on his website. However, since he has added “2019” in the description, it has become more appealing to the users. You can do the same for your blog posts by adding the updated date to the description itself. What makes you different from your competitors? Why should the customers opt for your services and choose your business over others? What special services do you offer that can be beneficial for the customers? Of course, you are more likely to offer certain services which make your brand stand out in the crowd. So, it is important to tell users about these services by mentioning them in the description. For instance, if you own an e-commerce business and offer free shipping, you can mention this in the descriptions of every product page. This will attract the majority of your target audience and eventually improve your CTR. 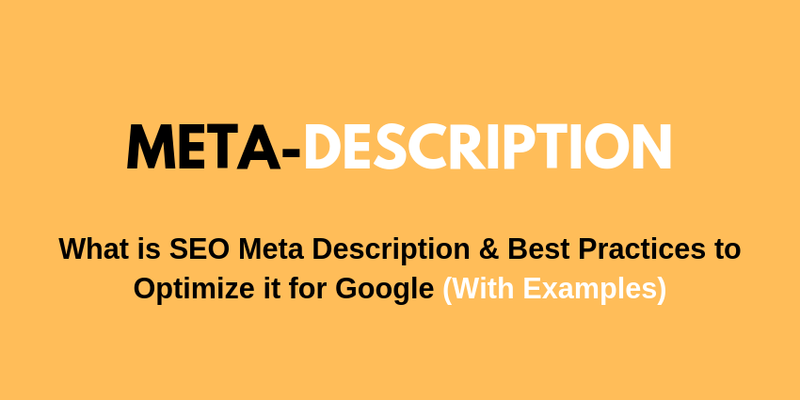 These are a couple of guidelines which will help you write the perfect meta descriptions for your web pages. Now, let’s take a look at some of the meta description examples which are perfect from SEO’s perspective. The above snippet shows the meta description of another blog post from Brain Dean. This description, though, is extremely concise and informative. If a new user finds this web page in the search results, he is more likely to click on it due to the highly appealing description and meta title. Now, even though this description has a comparatively shorter length, it does not harm the website performance at all. Being a well-known brand, Amazon has several other factors up its sleeve to stay in the top rankings. However, it’s still important to note that even a business like Amazon has bothered to mention the services in their description. You can follow the same guidelines to write SEO-friendly meta descriptions. The meta description is a crucial on-page element for any website. Even though it does not impact the search engine rankings directly, it is still important to optimize the descriptions to provide better user experience to your customers. An appealing and well-optimized meta description has the potential to captivate your target audience. Therefore, you must put in your efforts to optimize the meta description for each web page. It is also worth noting that meta descriptions alone cannot improve your website performance. You need to pay attention to other SEO factors as well. To ensure that your website is optimized for the search engine, take help from professional seo experts from SEO Experts Company India, an Award Winning SEO Company providing search engine optimization services to get your site on top of SERPs. Such experts always stay up to date with the latest SEO trends and can utilize the most-suitable SEO practices to make your website search engine friendly.